Where: At traffic circles, particularly mini circles. 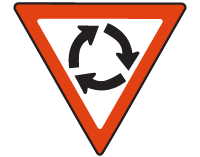 Purpose: To warn you that there is a traffic circle ahead where they must expect to yield. Action: Look out for other vehicles and yield to vehicles already in the circle or that will cross the yield line at their entrance to the circle before you will cross yours. Stop if necessary. • The driver who reaches his/her yield line first may proceed first. • At a mini circle you must, as at a normal intersection, signal in time in which direction you want to turn.